Athletics Victoria along with Melbourne University Athletics Club extend our most sincere sympathy to the family of our longstanding Patron. 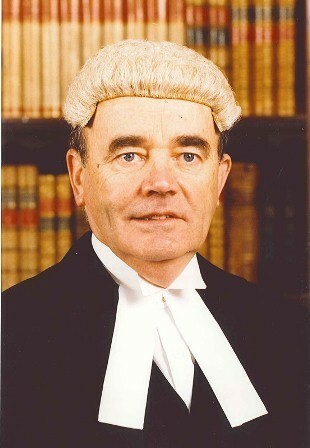 Hon Justice Alan McDonald AO QC served as a Supreme Court Judge from 1988 to 2002. In his final year at The Geelong College, 1954, he stroked the 1st Rowing VIII, was a member of the 1st XVIII and won the Geelong College Cup for Athletics. He had been a member of the Athletics Team from 1951 to 1954 and the Relay Team from 1951 to 1952. In 1955, he entered Ormond College, and the University of Melbourne, and graduated in law at the end of 1958. He was awarded a Full Blue for Athletics in 1957 and 1958. In 1959 he placed 5th in the Victorian Championships at the 220 yards, and was part of the MUAC team that was runner up in A Grade. The following year, he won a Victorian Championship in the 4 x 110 yards relay with Kevan Gosper, W Earle and E Sandstrom, and placed fourth in 220 yards final. After serving his articles and working for a year as a solicitor he signed the Bar Roll on 27 April, 1960, reading in the Chambers of former Collegian, W C Crockett. He was appointed a Queen’s Counsel in 1977 and on 29 May, 1988, appointed to the Supreme Court of Victoria. While a barrister he was involved in a number of activities. He was President (1976-1978) of the Victorian Amateur Athletics Association (which would become Athletics Victoria), one of eight MUAC members to have filled the role, and President of Athletics Australia (1978-1983). He served as Melbourne University Athletics Club’s Patron for more than 30 years. On 29 June, 1962, he married Margaret nee Turner. Funeral notice: Relatives and friends are respectfully invited to attend the Funeral Service to Celebrate the Life of The Hon. Allan William McDonald AO QC to be held at the Wesley Uniting Church, 100 Yarra St, Geelong on TUESDAY (27th June 2017) at 2:00 pm followed by a private cremation. The Victorian Institute of Sport, in collaboration with Athletics Victoria, the State Government of Victoria and the (Indian) Olympic Gold Quest, are pleased to announce the appointment of Cathy Woodruff for a two week coaching and mentoring program in Bangalore, India this July. The appointment of the role for Woodruff came with an extensive résumé of experience within the Track and Field community over a 25 year period. A Level 5 Athletics Australia coach of Sandringham Athletics Club has demonstrated an established track record among developing both junior and senior athletes across a variety of disciplines. Woodruff has developed a sound understanding of best practice for athlete development, through the engagement of coach mentors including Roy Boyd, Dr John Boas and Dan Pfaff, along with undertaking additional study in the fields of biomechanics, kinesiology and anatomy, among others. Athletics Victoria CEO, Glenn Turnor, said “Athletics Victoria is very pleased to confirm that Cathy Woodruff has been selected for this position. Cathy is currently the Athletics Victoria Target Talent Program horizontal jumps coach and is also an AV accredited Coaching Course Facilitator. Victorian Institute of Sport CEO, Anne Marie Harrison, said “In partnership with Athletics Victoria, the Victorian Institute of Sport are pleased to have highly experienced and respected coach, Cathy Woodruff represent the organisations in India for this exciting opportunity. Cathy will commence in early July with the role of coaching the Junior Indian track and field athletes whilst developing Indian sprint coaches in areas such as technique, programming and athlete development. It’s official, we’re a broken record. The weather today was insane. Literally the best day of the year – for winter anyway. Although the morning was a little chilly, it didn’t stop Schools arriving in droves and setting up tent city alongside the finish line. To say the atmosphere was electric would be an understatement! There was a feel amognst coaches and athletes that today was going to be a special day. Not only because state selection was up for grabs, but the fact there were record numbers lining themselves up at the start line to tackle the undulating course that is known to be tough! Getting things underway for the day were the Girls and Boys Under-14 km, with Lucinda Rourke (Williamstown High) claiming the first gold medal in the Girls division, crossing the line with a time of 10:59. Jaimee-Lee Code (Berwick Secondary) was second in a time of 11:12, with Amy Bunnage (Haileybury) rounding out the top three with a time of 11:18. Over in the Boys was Ethan Grills (CBC) who secured the gold medal with a time of 10:13! Kane Marriott (Glen Katherine) was second in a time of 10:14, and Bailey Morrell (Berwick Secondary) was third in a time of 10:21! Next up was the Under-15 division, with Taryn Fureltti (Kilmore International) taking the top prize ahead of Mia White (MacKillop Catholic) and Nicola Hogg (Firbank). Taryn finished in a time of 14:25, with Mia and Nicola finishing with 14:40 and 14:42 respectively. In the Boys draw it was Samuel Norton (John Fawkner) who narrowly beat Mac Anderson (Melbourne Grammar) and Luca Di Conza (St Kevin’s). Samuel finished with a time of 13:12. The Under-16 division started with Ebony Dodemaide (Westbourne Grammar) securing a gold medal in the Girls draw, with Georgie Laven (Lilydale High) and Yazmin Hayes (Rochester) rounding out the top 3. The Boys draw was extremely close with Harry Sharp (St Patrick’s) take top honours with a time of 12:56. Daniel D’Alberto (Peninsula Grammar) and Ethan McMinimee (Bacchus Marsh) battled it out for the second position with Daniel just pipping Ethan in times of 12:58 and 12:59 respectively. Abbey Caldwell (Doncaster Secondary) took out the Girls Under-17 division with a time of 14:04, which was well ahead of second place getter Amy Cornell (Ivanoe Girls’) who finished in a time of 14:40. Lily Peacock (Lilydale High) rounded out the top 3 with a time of 14:42. Over in the Boys draw saw William Collins (Mazenod College) take out first place with a time of 19:39. It was a dominant display of cross country running, as William was able to take down APS heavyweights Nick Fidler (Melbourne Grammar) and Matthew Hussey (St Kevin’s). In the Under-18 division, it was athletic superstar Sophie O’Sullivan (Wesley) who was too good for Annabelle Eastman (Star of the Sea), taking out another cross country event with a time of 14:14. In the Boys draw it was an all APS affair with Edwards Marks (Wesley) taking out the title in a time of 19:32. James Lightfoot (Carey Grammar) and Kang Nyoak (Wesley) rounded out the top 3 in times of 19:39 and 19:41 respectively. Combining the Women’s Under-20 Schools and XCR saw Amelia Mazza-Downie (Maribynong and Athletics Essendon) finish third in the XCR bracket and first for her school (22:27). Olivia Weston (St Margaret’s) was behind Amelia in the Schools division, crossing the line in second place with a time of 24:05. Known 800m superstar Georgie Hansen (Box Hill) had a surprise victory in the XCR division, taking out the win in emphatic fashion (with a time of 21:24) ahead of Lauren Ryan (Athletics Essendon) who crossed the line in second place with a time of 21:51. In the Men’s combined it was Cody Shanahan (Western Athletics) who took home the gold in a time of 25:56, ahead of Haftu Strintzos (Glenhuntly) who crossed the line in 26:08. We would like to than all Schools who have competed in our winter cross country season, and can’t wait to see everybody on the track at the end of the year, for what is sure to be an amazing summer! The afternoon was all about the Bundoora 10km for both the Women’s and Men’s Open division. All eyes would be on Virginia Moloney (Collingwood), who was coming off a solid win at Cruden Farm. Anna Kelly (South Melbourne) has been in amazing form this year and would also be looking to do well, after already achieveing a first and second place at Wandin Park and Cruden. Gemma Maini (Frankston) was back on the start line which was great to see, and Alexandra Paterson (Old Xaverians) was always going to be in the mix. Virginia got off to a flying start, and from there never looked like giving up her lead, as she went around the whole 10km in first place and finished off convincingly ahead of Alexandra, who also put in an unbelievable effort on a course which had the sun shining on it throughout the whole afternoon. Henrietta Lawrence (Frankston) ran a perfect race, finishing with her best result for the year with a bronze medal! Andrew Buchanan (Bendigo) was a notable absentee at Cruden Farm but was always going to be back at Bundoora to defend his title. Which he did! Andy never looked in doubt from the very beginning, taking it upon himself to take charge and see who would follow. Many tried, but it was Andy who kept his poise, grabbing another Bundoora victory and a spot at the National Cross Country Championships – which he says he will do! Harry Smithers (Geelong) crossed the line in second place, with Mathew Clarke (Old Xaverians) not far behind, rounding out the top 3. Next event on the XCR calendar is the Sandown Road Relays – see you there! The 2017 Athletics Victoria Annual General Meeting will be held in the Cathy Freeman Room, Athletics House on Wednesday 26th July 2017 at 7.00pm. Club Presidents and Representatives were emailed earlier today with the required information and notices. The AGM is an annual opportunity for the AV Committee and Management to present its report to the membership on the business of Athletics Victoria over the last twelve months. For more information about the Annual General Meeting, including Nomination Forms for the Committee, and all Awards (including Life Membership, Merit Awards, Regional Service and Venue Awards) click on the following link. Reminder to all Clubs that to participate and vote at the upcoming AGM, all affiliation fees must be paid by June 30 2017. This year, School Sport Australia and Athletics Australia will be conducting SEPARATE Cross Country Championships. However, two teams will be selected at the AV All Schools competition. One will represent School Sport Victoria (SSV) at the School Sport Australia Championships and one will represent Athletics Victoria (AV) at the Athletics Australia Australian Cross Country Championships. The Athletics Victoria All Schools Cross Country Championships on Saturday 17 June, 2017 at Bundoora Park is the selection trial for both teams. Selection will be made by the SSV / AV Cross Country Subcommittee based on the selection criteria included in this information package and also on the Availability Form you submit to us on the day. Athletes may choose to nominate for either one of or both the SSV & AV Teams. In order to be considered for the SSV team, you must satisfy the criteria and have submitted the Availability Form by Monday 19 June, 2017. Selection will only be made from those who have submitted the Availability Form. This form should be submitted to Team Officials at the Victorian Team Tent near the finish line on the day immediately after the race. Selected teams will be posted on the SSV and AV websites no later than 5 pm on Thursday 25 June 2017. Successful athletes will be notified by email of their selection. This year, both SSV and AV will be selecting Multi Class athletes to compete in the respective Championships. Multi Class athletes who wish to be selected in the SSV Team must compete in the SSV State Championships on Thursday 20 July. Multi class athletes who wish to be selected in the AV team will be selected from performances at the AV All Schools Championships. The attached information is intended to assist you in making an informed decision concerning your availability for selection. Please read it carefully. Note that if you are selected in the SSV Team, you will be required to confirm your place by & paying a strictly non-refundable deposit. SSV Team – SSV has a new uniform supplier, S-Trend. All SSV team members will be required to purchase the new uniform. Due to the new contractual obligations, no BLK or KooGa items of uniform can be worn. On selection & confirmation of your place in the team, you will receive an e-mail from SSV advising how you are to process and pay for your order via an online system. Please note that you will be required to pay at the time of ordering your uniform. Sizing charts are available online for all uniform orders. Uniforms will be sent directly to participants. The team to attend the ISF Cross Country Championships to be held in Paris France in March 2018 will be selected from the School Sport Australia Cross Country Championships ONLY. This means that individuals interested in being selected must nominate for the SSV Team and compete in the under 18 race for boys and girls. Kirsteen is on leave from 21 June to 3 July, so please contact Ian Landy (National Programs Officer) on 03 9488 9476. Administration Levy incl. Insurance, Transport & Photo –$560.00 approx. Team Flight – Melbourne – Hobart return $430.00 approx. Accommodation & Meals – $420.00 approx. FUNDRAISING Yes. Each team member will be participating in the State Teams Raffle and can raise $800 towards their costs. PROGRAM & COMPETITION 11 August – Fly to Hobart. 14 August – Rokeby Police Academy – Relays and Time Trials – everyone competes – followed by Presentations and Closing Ceremony. Fly to Melbourne. §SSV Team Vic Uniform Presentation – There will be a compulsory Presentation Day –Oakleigh South Primary School on Sunday 6 August from 9.30am – 12.00pm approx. involving social activities, team photo, uniform presentation. All team members are expected to attend. You must be a student attending a Victorian school affiliated with the SSV (secondary student) or (primary student). You must be at least 13 years of age as at 31 December 2017. You must submit an availability form to be considered for selection. Age groups for the School Sport Australia Championships are 13 years, 14/15 years, 16/17 years, 18/19 years (as at 31 December 2017) for boys and girls. Maximum of 15 athletes will be selected per age group. Maximum team size will be 60 able-bodied student athletes plus additional MULTICLASS student athletes (up to a total of 18). Two school teams (2 x 6 representatives – one boys and one girls) selected to represent Victoria will be included as part of the SSV team and therefore, they are expected to participate, behave and abide by all expectations in the full event, as any SSV team member would. First six across the finish line. Additional at selectors’ discretion. Next four fastest times from either race. Additional at selectors’ discretion. Winning Boys and winning girls schools in the under 18 age group. Athletes who have previously failed to uphold their responsibilities as a member of a SSV team (this includes prior to 2010, the VPSSA and the VSSSA teams) may not be considered for selection. Emergencies will be named and offered places in the team if /when any selections are declined. The 2017 Australian Cross Country Championship will be conducted on Saturday, August 26th 2017, at Kembla Joggers Cross Country Park, Wollongong, NSW. Athletics Victoria may nominate up to 6 male and 6 female athletes for the Open representative teams. Athletes must be registered as a competing member with a club affiliated with Athletics Victoria at the time of close of entries for the trial event at Bundoora on Saturday 17th June 2017. Athletes without permanent Australian residency must have been registered as a competing member with a club affiliated with Athletics Victoria for a minimum of two years. The trial event for the Australian Cross Country Championships is the Athletics Victoria XCR’17 Cross Country Championships, conducted at Bundoora Park. 17th June 2017. Both the open men and open women will compete over a 10km course at the trial. The Selectors will have the final say on the composition of the team and will take into consideration aspects such as head to head performances, consistency of performance, injury status and support for the XCR’17 series. In deciding the remaining members of the team, the selectors will take into account performances by athletes in the completed XCR’17 events, including relays. Extra weighting is given to the athlete’s performance at the 17th June 2017 trial event over any other XCR’17 event. Nominees will receive an acknowledgement email within 24 hours of nominating. If you do not receive an acknowledgement, please call Sean Whipp at Athletics Victoria on 8646 4500. The representative team, plus two reserves, will be announced by Wednesday 6th July 2017. All applicants will be advised by email. Athletics Victoria, in partnership with the Victorian Institute of Sport is excited to extend the following short term international coaching opportunity to a suitably qualified, Victorian Sprint Coach. To provide expert one-on-one technical coaching and mentoring to developing Indian sprint athletes and coaches. The aim of the Grants is to financially assist distance runners who are registered with Athletics Victoria, to achieve higher levels of performance. Athletes between 20 and 30 years of age may apply for amounts up to $3000 per annum. Funding requests could include participation in training camps, clinics and specific coaching programs and other costs directly associated with athletic competition. Athletics Australia Selectors have confirmed a green and gold team of 12 for the inaugural World Para-Athletics Junior Championships to be held on 3-6 August 2017. Set to provide the next generation of para-athletics talent with their first taste of international competition as they continue their development pathway towards the Paralympic Games, the four-day event will take place in Nottwil (SUI), a mecca for wheelchair racing thanks to its reputation for record breaking performances. “The addition of an international event for junior para-athletes is outstanding. It provides a much-needed introduction to the rigours of elite competition and that’s an important opportunity as athletes develop,” Dion Russell, Athletics Australia Chairman of Selectors, said. On the track, there are seven sprinters, each set to compete in the 100m for their respective disability class. Competing in ambulant events for athletes with a coordination impairment or limb deficiency are Liam Richardson (T35, Vic), Tamsin Colley (T36, NSW), Erin Garbler (T36, Vic), Samuel Walker (T38, Tas) and Alissa Jordaan (T47, NSW), while Nathan Donaldson (T34, Qld) and Gregory Luff (T34, NSW) compete in wheelchair events for athletes with cerebral palsy. In the 800m, Daniel Bounty (T38, Qld) and Will Howard (T37, Vic) will both compete in the boy’s two-lap race for ambulant athletes with mild cerebral palsy. Samuel Rizzo (T54, Vic), who is coached by Paralympic champion Richard Colman, will continue Australia’s proud tradition of wheelchair racing across the same distance. Competing in the field are Kailyn Joseph (T37, NSW) and Ari Gesini (T38, ACT), who will both take to the runway for the long jump. The World Para-Athletics Junior Championships caters for athletes aged under 20, competing across two age groups (14-17 years old, 18-19 years old). The Championships will be held at the Sport Arena in Nottwil (SUI) in 2017 and 2019. Australia’s team for the World Para-Athletics Junior Championships will depart Australia on 29 July 2017, arriving in the host city the day following. Competition commences on 3 August 2017 and spans four days. For more information about the World Para-Athletics Junior Championships, please click here. T47: The athlete has a single limb deficiency, below the elbow, or an equivalent join restriction or muscle weakness in one arm.